Keywords are the easiest way for students to know which present tense they should use. If the students know them, they are more likely to choose correctly which present tense they should use in the given sentence. Moreover, once they remember and understand the keywords, they might be able to form the underlining grammar concept in their brains. Display or print the following infographic for your students. Explain, that the easiest way to use the correct tense is to look for keywords. 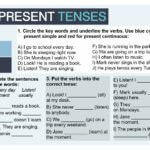 Once they find any of the words in the boxes, they choose the correct tense – present simple or continuous. Mention that the colours show where the word usually goes in the sentence. Words in light blue squares come at the beginning of a sentence. Light green words come after the subject and the words in the dark blue squares come at the end of a sentence. This of course isn´t true in 100% of cases. Sometimes the words can appear in a different position. You can print the pdf file here. Once you have finished your explanation, ask the students to do the first exercise. Students read the sentences and circle the keywords and underline the verbs. They use the red colour for the present continuous tense and blue for the present simple. In the second exercise, students complete the sentences with the keywords. In the third exercise, students put the verbs in the correct tense. Once you finish the exercises, I suggest that you ask the students to learn the keywords by heart. It might seem a bit harsh, but to be able to use the foreign language, you have to know the words by heart. First ask them to learn the words for the present simple tense only!!! 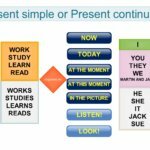 Even though textbooks give both of the tenses the same amount of attention, in reality the present simple tense is between 5 and 20 times more frequent than the present continuous tense. 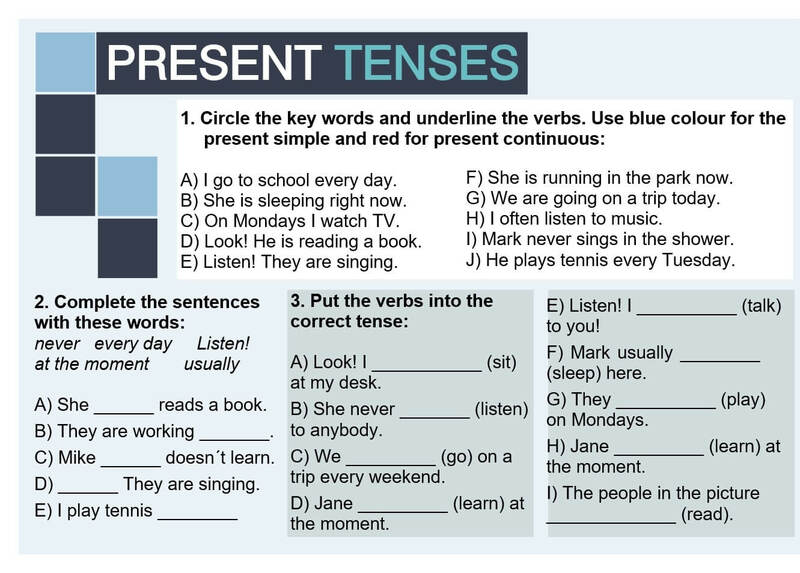 Thus, if the students are not sure, they should use the present simple tense. Hi there! How do you do? I like these kinds of learning English. I prefer this way to study grammar rules. Thanks a lot for this ability to use these pictures. You are very creative people. There are exercises and games so it’s great. Good luck! Have fun! Goodbye.